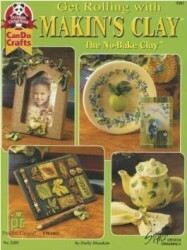 Get Rolling With Makin's Clay! The no-bake clay is perfect for anyone who has never used clay or those who have a lot of clay experience. In this book find ideas for projects such as frames, albums, home-decor, plates, baskets and more! Full-colour photos and easy-to-follow instructions will have you clay-making for hours! 34 pages.